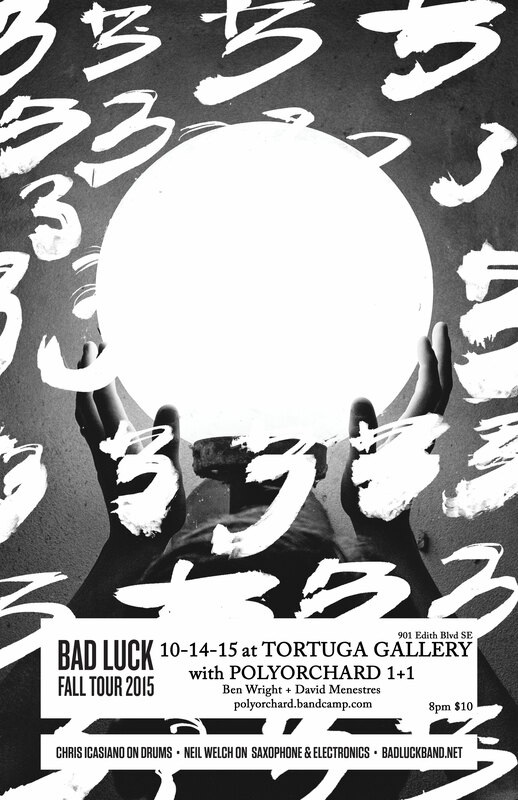 On October 14th, the newest iteration of Polyorchard will be opening for Bad Luck at Tortuga Gallery in Albuquerque. Polyorchard 1 + 1 will feature the double bass madness of Ben Wright and David Menestres. Bad Luck from Seattle will be on tour featuring Chris Icasiano on drums and Neil Welch on saxophone/electronics. Show starts at 8pm and is $10 at the door. Over half a decade after their first performance, drummer Chris Icasiano and saxophonist Neil Welch continue to develop a unique musical voice together. Bad Luck has become a sonic outlet to be reckoned with. In the highly trodden medium of drums and saxophone, Bad Luck proves that there is much left to be said. Called “One of the best Seattle jazz recordings in years” (Earshot Jazz) Bad Luck was awarded the “Best Outside Jazz Group” of 2009 by Earshot Magazine, and a finalist for “Best Avant Group” in the 2009 Inside Out awards. Performing all original compositions, the pair use live loops and pedals to create an astounding range of sound. Icasiano and Welch can quickly shift into fierce improvisations, sound art and carefully constructed harmonic palettes. A duo with skin tight precision and melodic inventiveness, their music is set off by a commanding stage presence.